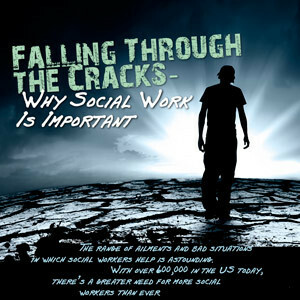 Falling Through the Cracks: Why Social Work is Important The range of ailments and bad situations in which social workers help is astounding. With over 600,000 in the US today, there’s more need for even more social workers than ever. or, a supervised, temporary shelter. With 4.5 American children dying per day because of maltreatment. And it pays off. Because with help, bad outcomes can be avoided. Children experiencing child abuse and neglect are 9x more likely to become involved in criminal activities. 2/3 of people in drug abuse treatment facilities report being abused or neglected as children. With 1/3 of abuse or neglect reporting adolescents having a substance use disorder by the age 18. That’s at least one person in any room of ten. Or 5.5 NY’s. Of people living in poverty. Research shows that families need about twice that to cover basic income. Over 1/3 children in Mississippi live in poverty. While only 1/10 in North Dakota are under the poverty line. Leading to over 6 million children living with at least one parent with a drug addiction. And we consume 75% of the world’s prescription pills. With non-medical prescription drug use rising 500% since 1990. Bachelor’s, Masters or Doctorate depending on position.